I’m sure I’m not the only one to know one or two people who seem to know everyone; you know, the sort of person that you always go to as the ‘font of all knowledge’; who always seem to know who you should contact. Whether it’s an electrician, a plumber, somebody who works in the council, the bank, whatever. 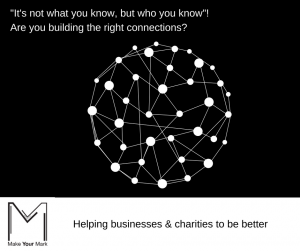 Being connected is a fundamental part to any business or charity. How well connected are you? 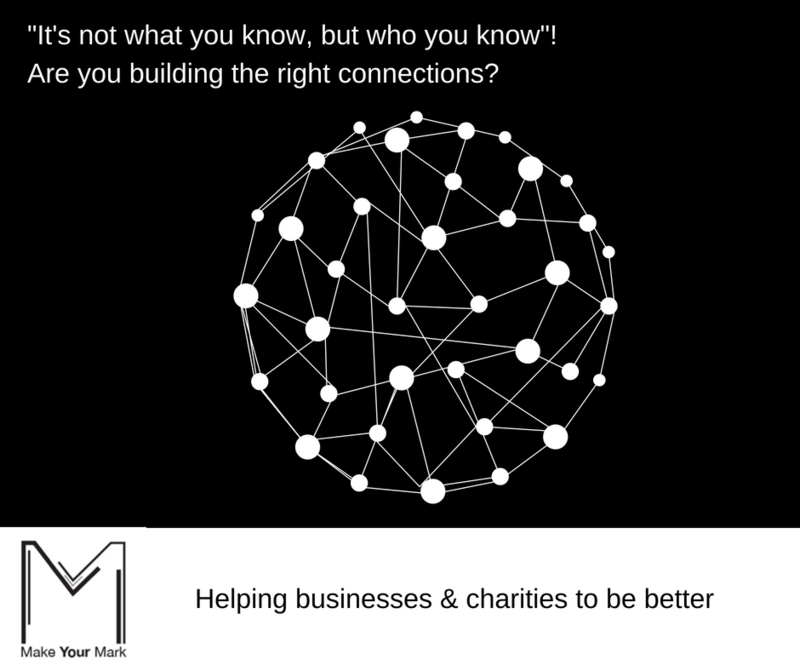 I remember about 12 years ago when I was working in senior management within the charity sector, I consciously thought that I want to be like the person I go to when I want to know who to speak to; I want to be that go to person; I want to be well connected. As the saying goes, ‘its not what you know, but who you know’! For me, that’s not about pulling rank or bypassing the system, but its hard to deny that knowledge is power and knowing the right people can help open doors. From a very basic point of view, rather than calling a generic telephone number for an organisation, or sending an email to a general ‘admin@’ or ‘info@’ etc address: it’s a no brainer that its often more effective if you have a named person and have some sort of connection with them, in order to get your desired outcome. Making such valuable connections means you have to get out there! It means going to networking events, being active on a range of social media platforms and putting yourself in situations in which you can meet people. “Sounds scary”, you say? “Involves a lot of time”, you say? 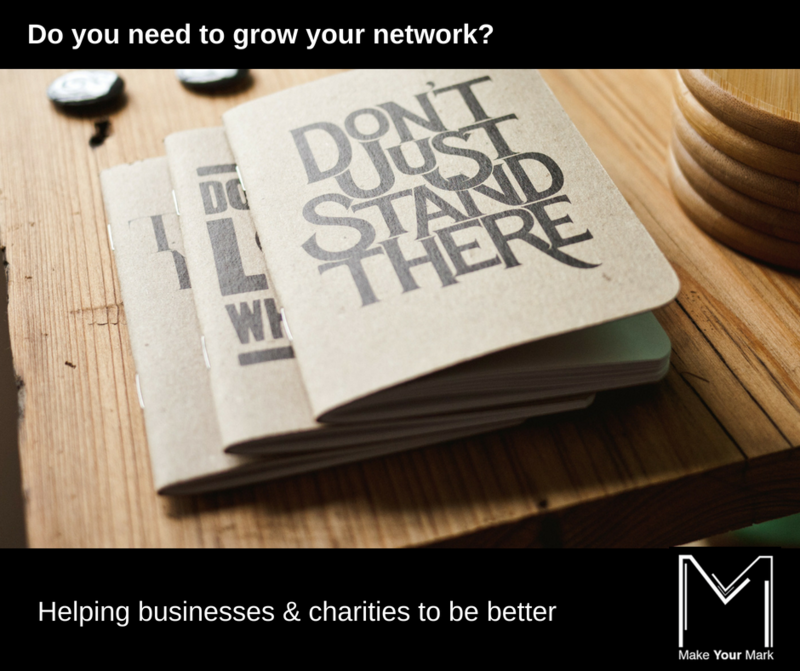 “Can be expensive”, you warn at the thought of membership fees of networking groups, event fees (for that bacon sarnie and coffee etc) and also the time you are taking outside the business or charity when you could be getting stuck into your long to do list. If you are not convinced, I’m happy to tell you that about 98% of my business comes from personal connections, contacts and my network. Did I think a few years ago before setting up my business, that I would in the future be running my own enterprise and that several of my contacts would be my clients and customers….no! It is all too tempting to approach networking purely from a selfish point of view and with the mentality of ‘what can I get out of this?’ with the thought ‘how can I get more customers’ or ‘donors’? Most people don’t like being sold to and it’s a bit like repelling magnets – if all anyone ever did at networking events was ‘sell, sell, sell’ then others there are likely to be turned off. Therefore, always think about the added value you can offer to the people you meet, especially at networking events. If you can give some suggestions of who they may like to have a talk with, the person is most likely to be extremely grateful and likely to return the favour. It also gives you a warm, positive feeling! Try it! Unless you are extremely lucky, I would say its quite unlikely for you to be a ‘one hit wonder’ and ‘strike gold’ at your very first networking event – by that, I mean meeting the one person who will be the ideal contact. Building your network and connections takes time, effort, energy, time and money. See it as an investment in marketing: raising awareness about your business or charity, your products or services but also you as a person. It takes time to raise your profile, for people to get to know you and of course for you to become trusted. As a person, are you the ‘early bird that catches the worm’ or the ‘night owl’. In other words, are you the sort of person who jumps out of bed in the morning, with the spring in your step and you are totally fine with attending (very) early breakfast networking events; or do you need to be dragged (kicking and screaming) out of bed any time before 8am or in fact any time in the morning in general? If you come alive in the late afternoon and evening, you may find it easier to book onto networking cocktails/drinks events in the early evening. There are no right or wrong answers with this: the best thing to do is try a range of different events and activities and at different times. It can be a bit time consuming but it will help you to get into the habit of networking on a regular basis. And remember: not everyone is like you! If you are not a morning person and avoid trying the breakfast sessions, you could be missing out on a whole bunch of contacts, future customers and partners. This is much easier said than done. The thought of walking into a room full of people where you don’t know anyone can be daunting, terrifying and scaryy. I get it. I do get it. That use to be me. It was always tempting to hide in the hotel reception area where the networking event was taking place, flicking through the latest magazine or the range of tourist information leaflets. In his book ‘Business Networking – The Survival Guide’, Will Kintish (an expert in the art of networking), talks about several types of individuals or groups that you are likely to find at any networking event. One of these is ‘Betty’ who clutches on to her handbag for dear life, standing in the corner of the room on her own and quite frankly, looking terrified and nervous. He then talks about groups of two or three people where the people are either quite closed in their body language, standing very close together and intent on one another. Compare that to another group who are more open, perhaps with more space between them and facing outside the group rather than in the group. Generally, it would make perhaps more sense for you to approach Betty, (who is on her own) first as she is bound to be so grateful for anyone to talk to her, that it will be easy for you to start a conversation. Likewise, its usually easier to approach a group of two or three people with open body language, (rather than closed) as they are more likely to chat to you and you won’t feel as intrusive joining them. I always think why make it hard for yourself? If you are already feeling a bit nervous, go to the person or groups who are more likely to be welcoming of you, rather than interrupt the friends or old colleagues who are engrossed in deep conversation. It never ceases to amaze me that after all the effort a business owner or charity worker puts into attending networking events (the cost of business cards, taking the time out of their day to attend, the cost of the event entry fee and travelling time and cost etc) then not to do anything after with the contacts they have made! Whats the point! Such a missed opportunity to connect and to develop the relationship further once you have that initial contact over a bacon butty! At the very least, ask at the time of meeting the person if they are on LinkedIn* and can you connect with them? You could even ask them if they would like to arrange to meet for coffee to talk further about what they do, or how you might be able to work together etc etc. * if you need any help with LinkedIn, get in touch and ask about our ‘how to be LinkedIn’ training workshop. What other tips would you recommend? Have you tried any of the above ideas out? How did you find them?